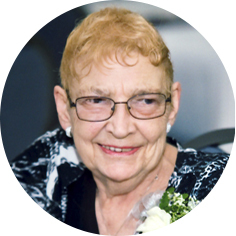 Shirley Ann Schmidt, a former long-time resident of Riverhurst, SK passed away peacefully, with family by her side, on Thursday, November 15th, 2018 at the age of 80 years. She was predeceased by her husband, John in 2005. Shirley will be lovingly remembered by her children: Rob (Sherry), Dave, and Beth (Gerald) Gane; grandchildren: Justin, Jaclyn (Jason), Dusty (Melissa), and Todd; and great-grandchildren: Carson, Chase, and Rawlins. The Funeral Service will be held on Wednesday, November 21st, 2018 at 11:00 a.m. in Moose Jaw Funeral Home. Pastor Marvin Seaborg will officiate and a private family interment will take place at Riverhurst Cemetery. Flowers are gratefully declined. As an expression of sympathy, donations in Shirley’s name may be made to a charity of one’s choice. Arrangements are entrusted to Moose Jaw Funeral Home, 268 Mulberry Lane. Todd Sjoberg, Funeral Director 306-693-4550. Our sincerest sympathy to the family. So sorry to hear of Aunt Shirleys passing.Our family’s sympathy to all three of you. The memories are mostly around Melfort and also Riverhurst; we had a good visit in Moose Jaw with Rob, Shirley just a few years ago. She was a special person to us. Our deepest sympathy to you and all your families. Many a laugh was had with Aunt Shirley. Eileen, Sheri, Penny, Jay and families. Very sorry to hear of Shirley’s passing… The Thompson’s and the Pomeroy’s send deepest sympathies!!!! Sorry we are not able to be with you for your Service!! Our sincere condolences to Rob, Dave and Beth and your families, for the loss of your Mom. Aunt Shirley was a wonderful person. I am so sorry for your loss, Rob, David and Beth. Where did all the years go? I have many fond memories of her, and of their place both in Melfort and at Riverhurst. My thoughts are with you. Our deepest condolences to our cousins and nephews & niece, Rob, Beth and David. We remember the times together today and growing up close when we were in Melfort. Loved Aunt Shirley’s love of cats! Thinking of you in your time of loss. Our thoughts are with you and our memories of times we spent together in Melfort. Rob, David and Beth and families, we extend our sympathy and condolences to you at this time. I remember how Aunty Shirley loved her cats! I have been thinking of you all all day My thoughts, love and prayers are with you all Aunt Shirley was always special to me and we always shared our love for cats I will always treasure the quilt she gave me on my last visit to see her Love you all!! !